It’s been more than eight years since Barry Bonds hit the last of his record-setting 762 career home runs, but apparently the 51-year-old can bring the wood. 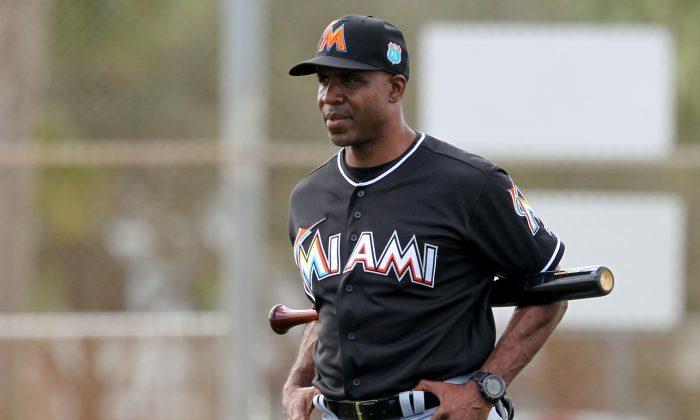 Bonds, the new hitting coach for the Miami Marlins, took on the Marlins team—including slugger Giancarlo Stanton—in a home run hitting contest on Wednesday and won, according to SiriusXM’s Craig Mish. Taking on the Marlins besides Stanton is one thing, but the Marlins 26-year-old slugger hit 27 home runs in just 74 games last season and already has 181 for his career. Maybe Bonds should consider a comeback. Unfortunately there’s no recording of the now infamous event. There won’t be video. I caught the end. Fumbled on the way to periscope. Fail. Bonds last played in the majors in 2007. Then 43, Bonds still hit 28 home runs in 130 games while drawing a league-high 132 walks and .480 on-base percentage, while hitting .276. No team signed the game’s all-time home run leader in the offseason and Bonds eventually retired. A winner of seven MVP awards—more than twice anyone else has—Bonds has yet to crack the Hall of Fame, in large part to rumors that he used performance-enhancing drugs. Bonds’ career arc was somewhat unusual. A first-round pick of the Pittsburgh Pirates in 1985, the five-tool outfielder won MVP in 1990 and again in 1992 while in Pittsburgh. His rare combination of speed on the basepaths, Gold Glove defense in the outfield, a powerful swing and incredible patience at the plate made him the most complete player in baseball. After signing with San Francisco following the 1992 season, Bonds won another MVP in 1993 after helping lead the Giants to 103 wins. From 1994–2000 Bonds finished in the top 25 of the MVP voting every season, while winning five more Silver Sluggers (he won 12 in all) and four Gold Gloves (he finished with eight). But in 2001—the year he turned 37—Bonds all of a sudden bested Mark McGwire’s single-season home run record by hitting 73 home runs, while posting an unheard of OPS (on-base plus slugging) of 1.379 that was second only to Babe Ruth’s 1920 season, in addition to drawing 177 walks—another single-season record. The performance won him his fourth MVP and Bonds would follow it up with MVP performances in each of the next three seasons while breaking his own walk record twice (198 in 2002 and then 232 in 2004, as a 40-year-old) and OPS record (1.381 in 2002 and then 1.422 in 2004). Bonds then missed a bulk of the 2005 season with injury before coming back in 2006 to pass Babe Ruth in home runs (714) and then Hank Aaron (755) the following year. "If the knife is rusted, I can't be busted."